Everything you see in our cases—every pastry, every loaf of bread, every dessert, every cookie—was made with a lot love by hand by our staff, from the best ingredients we can get, right here at our bakery in Jackson, Mississippi. But there’s more to our story than that. Behind the love we put into our work, there’s a legacy and that legacy was started by a face you’re already familiar with. We put his pictures on our menus and up on the wall. 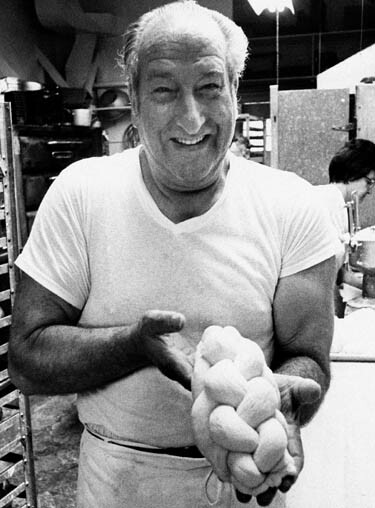 The man holding the challah bread is Sol Blumenthal, grandfather of Broad Street founder and executive chef, Dan Blumenthal. Sol was born in Trenton, New Jersey in 1903. His parents, Barney and Hannah, like millions of Eastern European immigrants with dreams of a better life, came to the United States in the 1880s via Ellis Island. The Blumenthals settled in Trenton and Barney, a baker, immediately began practicing his trade. As soon as Sol and his older brother, Frank, could see above a bread bench, their father taught them everything he knew about his art. Through both World Wars, Sol and his brother continued to perfect their techniques. In 1946, shortly after the end of World War II, Sol purchased a small storefront on Broad Street in Trenton and opened BLUMENTHAL’S BAKERY. Sol and his wife Deborah ran that bakery and two others in Trenton for twenty years. Fast forward a few decades and in 1998 Sol’s grandson, Dan Blumenthal, along with his partner and best friend, Jeff Good, opened BROAD STREET BAKING COMPANY & CAFÉ as a tribute to Sol and the legacy he left behind. We hope to take you back to a time and place where generation after generation of artisan bakers created breads from scratch, following old-world recipes with their own two hands. Originally from Miami, Mike made Jackson his home after graduating from Jackson State University. He has a huge heart that he gives unconditionally, which helps him succeed everyday when it comes to pleasing guests at Broad Street because everything he does day in and day out is genuine. You can email him at michaelt@broadstbakery.com. Born and raised in Central Mississippi, Katie has been in the restaurant industry since she was old enough to work. She has worked nearly every possible position in a restaurant from tableside wine service to line cook to cashier, and everything in between. Now as Broad Street’s Service Manager, she relishes the opportunity to learn something new everyday from guests and co-workers alike. Passion, hard work, and a thirst for knowledge are what drives her. You can email her at katiel@broadstbakery.com. A veteran of the restaurant business, Aven oversees the Mangia Bene Catering operations for BRAVO!, Broad Street, and Sal & Mookie’s from ordering, to production, to completion of events. He has catered everything from intimate brunches, to black tie affairs for 3500, to a seated luncheon for 1200 in honor of the President of the United States. His Delta roots and desire for culinary perfection drives him to make each event unique and exciting for his clients. When he is not catering, you can find him enjoying time with his wife and two beautiful children or somewhere playing his guitar. You can email him at avenw@broadstbakery.com. Jaime started with Broad Street as a front house manager before becoming our Mangia Bene Catering Coordinator . She absolutely loves talking to guests one-on-one to plan the perfect event for them. Food is her passion, and she loves working with our chefs to come up with new and exciting menus. Nothing is more exciting for her than seeing her client’s vision for their party become reality. You can email her at jaimef@broadstbakery.com.